The ever-over-wrought Alan Jones was launching a book about political correctness the other day and was quoted as saying that “primary school children today know more about the 'fictitious' Welcome to Country than they do about Burke and Wills (who ignored the welcome that Cooper Creek Aborigines offered to their Country, and died), and believe that climate change will soon see Bathurst on the coast, but can't explain how Macquarie Street came to be named”. If only Mr Jones had either read the new book called 'The Sydney Wars' or popped up to Canberra to see 'The National Picture: The Art of Tasmania's Black War' at the National Gallery, he might have had cause to reflect on the injustice of naming New South Wales's most politic street after the man who initiated the Sydney Wars against its First Inhabitants. For Macquarie's methodology was then copied by Governor Arthur a decade later in Van Diemen's Land. Historian Stephen Gapps has written an extraordinarily detailed study of contemporary sources from Sydney between the years 1788 and 1817 which consistently use the word “warfare” to describe a situation that may have been closer to guerilla war than the contemporaneous Battle of Waterloo but certainly caused a minimum of 80 colonist deaths and 74 wounded. It also involved more than 250 successful Aboriginal raids on properties and stores in the ever-expanding land-grab which had the effect of both pushing the 'Sydney people' (as Gapps tends to refer to the tribespeople of the Eora Nation) out as well as denying them access to supplies of food in the form of wild animals and fish that the colonists themselves desperately needed in those early days. On the fertile banks of the Hawkesbury, which was settled by 1794, the Darkinjung people's yam beds were rooted out to plant corn. Some then referred to their revenge attacks as 'the maize wars'. This shortage of supply was a problem for both sides. As the colonists waited for the Second Fleet to arrive on June 2nd, 1790, well-founded fears of starvation were a powerful incentive to protect crops. In April that year, the settlement was just 8 weeks from abandonment. Of course, Aboriginal demand had fallen mightily by then, for smallpox – which, amazingly, had the pre-existing name of galgala – had cut the likely local population of 600 in half. “That saved the colony”, estimates Gapps. So constant expansion was inevitable on to the fertile lands at Parramatta, Prospect, Windsor, all along the Hawkesbury - even after Governor Phillip Gidley King had promised no more settlement there - and eventually over the Blue Mountains, where the particularly aggressive Gandangarra people invariably fled back to after their guerrilla raids on the Cumberland Plain. Also inevitable was the resistance that later historians would deny on the grounds that Aborigines were “traditionally pacific”. Tell that to the Cooks River Bidjigal, lead by “a riotous and troublesome savage” called Pemulwuy! His infamy began with the 1790 spearing of a hunter called McIntyre, who had certainly killed more than game in his time. Pemulwuy was later hit by buck-shot as he lead his troops on the outskirts of Parramatta, gaining a reputation for immortality – which he lived up to into the 19th Century, when Governor King first noted that the Aborigines “didn't like” this incursion upon their lands, and actually admitted that “they are the real proprietors of the soil”! However, in May/June 1802, a chance encounter with an armed group saw the guerilla leader shot and decapitated. The head of this “terrible pest” was offered to the 'scientist' Joseph Banks. At various stages, other leaders popped up – Pemulwuy's son Tedbury, Mosquito and Bull Dog. But the former was killed when seen “drunk and threatening” in Parramatta, and the latter two were captured and exiled to Norfolk Island for 7 years. And things quietened down – until Lachlan Macquarie arrived. In 1810, he opened up the Southern forests to settlement, which immediately stirred up trouble. Farms and crops were fired, there were mutilations on both sides and a story went about that the Gandangarra and Dharawal peoples had joined forces to “kill all the Whites before them on the night of the June full moon”. However, it seems that the thousand-strong 73rd Regiment that came with Macquarie and the increasing militarisation of the general populace – an armed Loyal Association was formed and even convicts in outlying areas were armed – kept things under control. However, in 1814, the soldiery was cut in half. A group of convict workers whose possessions had been taken by Aborigines pursued them across the Nepean, only to be surrounded by large numbers of the “Mountain natives”. They surrendered their weapons, which were turned upon them, killing four. In March 1816, a reasonable sized force headed up on to the Razorback Range upon reports of an imminent attack on John and Elizabeth Macarthur's Farm, but was outflanked by “the enemy on a high rock showering them with spears”. The rotters had learnt just how long it took to reload a rifle in those days, would lie down when they fired, and then leap up and hurl spears. The colonial force was routed. So in April, Macquarie determined “to clear the country of them entirely”, for he had failed in “all efforts to civilise a great proportion of them”. Some individual natives were named in his Proclamation, but all Aborigines were called upon to surrender or be shot if they refused. This lead to the Appin Massacre, commemorated in 2016, in which 30 guns were turned on a sleeping group of Dharawal with 14 killed, including women and children. Two, including the proclaimed Cannabaygal, were decapitated, gibbetted and hung from trees. What was not noted in 2016, though, was that Capt James Wallis's troupe which committed this massacre was just one of three sent out by Macquarie. The others failed to engage but took 16 prisoners, one of whom was exiled to Van Dieman's Land as “the duty of a civilised nation”! This effort took the steam out of the resistance, and by May 1816, Macquarie was confident enough to cease the military action on this side of the Blue Mountains (though not on the Bathurst Plains, where martial law would have to be imposed in the late 1820s) to introduce four Regulations: No spears or spear-throwing contests (which had been very popular); No groups greater than 6 permitted to gather; and all Aborigines living amongst the colonists must carry a 'passport' signed by him. The Sydney Wars had come to an end. On 28th December, there was a meeting in Parramatta marketplace where 179 Sydney people attended and tribal chiefs “sued for peace”. Aborigines who'd guided troops against their own people, like Colebee, got breastplates, and “the hostile spirit of violence and rapine” was over. But then there was Tassie! Who'd have thought that the National Gallery of Australia (NGA) would put on such a historical show, which Director Gerard Vaughan describes as “challenging, courageous and necessary”? But then it's put together by two historians – Dr Greg Lehman from UTAS and Prof Tim Bonyhady from the ANU – rather than art curators. It also seems to have slipped imperceptibly into the NGA, in a back gallery, just as the big commercial Cartier show of jewellery hit the headlines. However, it does have a significant catalogue. And it does have artistic content to illuminate its undoubted historical significance. Much is made (too much?) of the importance of one Benjamin Duterrau, artist, who arrived from England in 1832 with a lacklustre career behind him. 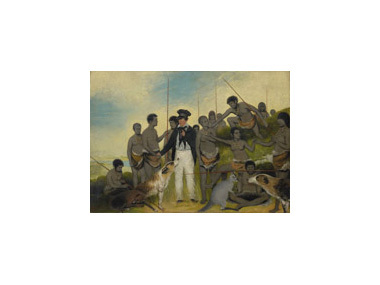 Like the more famous (and talented) John Glover, his arrival was after Van Dieman's Land's 1828 declaration of martial law had been lifted and just as the Black survivors of that were being shipped off to Wybalena on Flinders Island in the Bass Strait. So what he was painting was what the notorious GAR, George Augustus Robinson – the self-styled Pacificator – wanted him to paint. The centrepiece of the exhibition is 'The Conciliation', painted in 1840, which is but a minor prototype for a much grander 'The National Picture', a mighty piece of propaganda, which, sadly, has disappeared. But there, surrounded by admiring Tasmanian men (and the odd, more sceptical woman) is our hero – GAR himself in his rather camp “bush outfit”, an identikit image which Duterrau repeats time after time in paintings. A dog and a kangaroo in harmony, are supposedly a metaphor for GAR's successful pacification. But then, according to the exhibition, he was also the bloke who took money from colonists to declare land open for “pioneering”, and then took more to get it cleared. For one and sixpence you could buy a Duterrau print of GAR and the claim that “he had removed the natives without bloodshed”. And the State of Tasmania (or was it still VDL?) actually bought four mighty portraits by Duterrau of the now-absent Aboriginal leaders, including Woureddy and the wife that GAR had given him, Truggernana – whom we 'know' as 'Truganini, the last of her people'! Revealed in this exhibition is the sad news that the reason these subjects were chosen was that they had sided with GAR against their own people, guiding him on his missions to lure them on to Bass Strait islands with offers of free sugar and tea, Christianity and the opportunity to transform themselves into peasant farmers. Duterrau's Truggernana is shaven-headed and smiling; sculptor Benjamin Law's much more impressive bronze bust from 1836 shows her curly-haired, fierce and proud. Thomas Bock – surely the greatest artist of this era in Tassie, with a series of sympathetically believable portraits including his iconic 'Mathinna', the girl briefly adopted by Governor Franklin and then abandoned – gives her eyes of fire, suggesting that Duterrau's smiles were 'put on'. The exhibition opens with a deceptive landscape by Glover. He may have invented the Tasmanian people in wild corroboree, but close observance notes that he's placed them in the shadows while fertile lands across the water enjoy the rich sunshine. We then move on to Surveyor-General Frankland's efforts to communicate British justice to the natives through his famous 'rule-of-law' boards showing both Black and White being hanged for killing each other. The late Gordon Bennett has done an ironic dot-painted 'Double Take' on that – one of several contemporary commentaries on and in the exhibition. There's also an amazing oil painting by “An Aboriginal boy” of sailing ships at sea, painted before 1836. Eat your heart out Namatjira! It was perhaps encouraged and certainly collected by GAR and passed down through his family. When propaganda was no longer needed, in 1847, the surviving cowed and now Western-clad Tasmanians were allowed to leave Bass Strait for a disused penal settlement at Oyster Cove, south of Hobart. 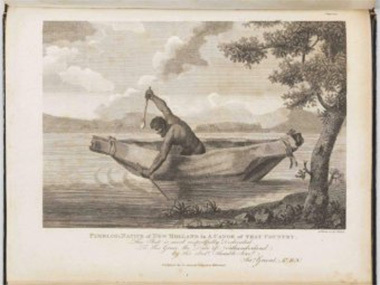 Just 47 (or 49 – the exhibition and the catalogue differ) made the trip – leaving behind others who'd become attached to non-Indigenous sealers on the islands. Nevertheless, colonists were up in arms at this new 'threat' to their peace and prosperity. It had taken a petition to Queen Victoria to remind the authorities that GAR had promised a mainland Tasmanian future to them if they surrendered. One of the authors of that petition was Walter George Arthur, photographed in 'native' pose in a group of three in 1847/8 by Thomas Browne, and showing just how untrue the 'Truganini, last of her people' lie really was. At the time, there was good market demand for such colourful authenticity! 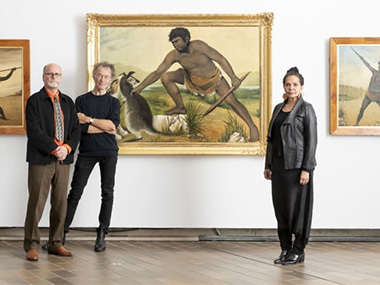 'The National Picture' runs at the NGA until 29th July, after which it'll head for Tassie, opening in Hobart in late August. In the meantime, it's appropriate to commemorate the 180 years since the Myall Creek Massacre near Inverell in northern NSW, when an unprovoked attack by a group of stockmen on Myall Creek Station killed twenty-eight Wirrayaraay women, children and old men in 1838. Because of the roundness of that number, the annual event has become a major one featuring symposia, art shows and talks in Armidale, a concert in Bingara, as well as the usual walk to the site on Sunday (10th June) during the morning. Something I've learnt only recently is that Myall Creek's infamy was mitigated somewhat by the unique prosecution, trial and condemnation of those involved. This was achieved by John Hubert Plunkett, the Attorney General for NSW from 1836 to 1856. He was the first Roman Catholic to be appointed to high civil office in the colony, and his conscience led to the hanging of seven white men for the massacre – the commemoration of which has produced its own motto: “The path to the future passes through the past”. Benjamin Duterrau's 'The Conciliation' (1804), starring George Augustus Robinson and grateful natives.